Another exterior view from the early 1940s, this time with the crows nest. Before cut in two for a duplex, the Admiral’s interior was both lush and grand. In anticipation of its inaugural night, the West Seattle Herald exclaimed, “It transcends every preconceived idea of motion picture theatres, and will amaze everyone with its new beauties, its new revelations in comfort, sight and sound.” The nautical excitements continued inside with fluorescent murals of underwater scenes, a grand mural of Captain George Vancouver’s 1792 landing on Puget Sound, a ceiling sparkling with lantern projection of the signs of the zodiac, and usherettes ship-shape in naval uniforms. Forty-seven years later the Admiral struck the bottom-line when, without warning or comment, the expansive Toronto-based theatre chain Cineplex Odeon closed it. 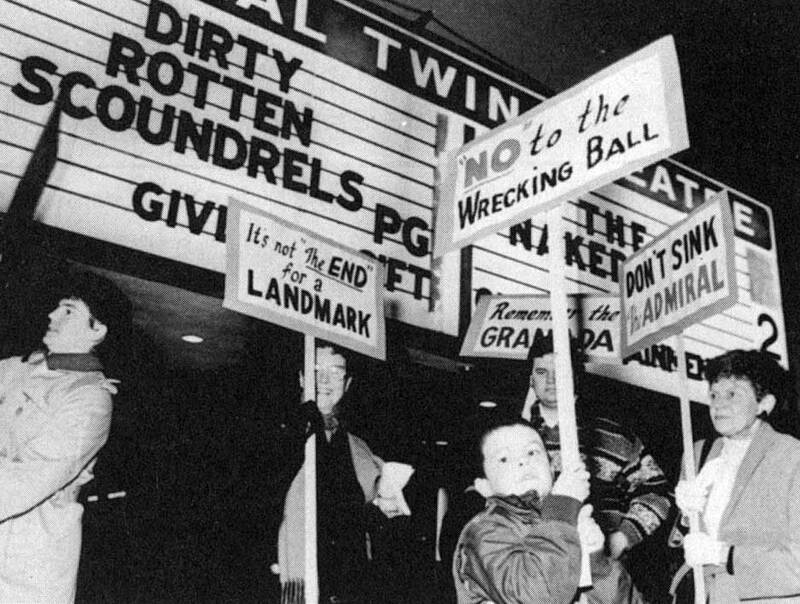 And eleventh-hour leak of their intent brought out the pickets in a protest for the preservation of West Seattle’s unique example of the art of motion picture theatre design. Cineplex Odeon bought the Admiral in 1986, raised the prices, cut the staff, and let the place run down. Then, intending to build a multiplex theatre in a new mall planned near the West Seattle side of the new high bridge to West Seattle, the corporation put the Admiral on the block. Understandably, the preservationists found the last night’s bill “Dirty Rotten Scoundrels” appropriate. On another January night 47 years after its opening, West Seattle citizens protest the sudden closing of the admiral. Appropriately, or ironically, the film that was playing when the theatre went dark was “Dirty Rotten Scoundrels. Clay Eals, then the recently departed editor of the Herald and the just-installed president of the Southwest Seattle Historical Society, and editor of “West Side Story,” the Herald’s 1987 oversized history of the Duwamish peninsula, was one of the preservationists struggling to save the Admiral. In six months of energetic organizing, the historical society secured city landmark status for the movie house. This past Sunday, May 3, 2009, Clay returned to the stage of the Admiral as master of ceremonies for Seattle’s part in the nationwide celebration of folksinger Pete Seeger’s 90th birthday. The lesson was – and the song was sung, too – “We Shall Overcome.” In 1989, the people, Clay Eals and Priteca’s creation also overcame. 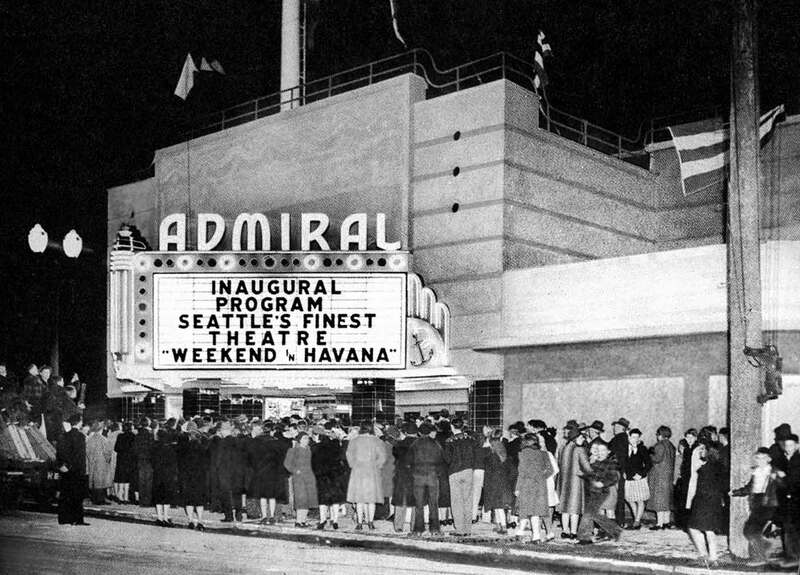 The Admiral, after a three-year closure followed by the theater’s purchase by the preservation-minded Gartin family, reopened in 1992 and shows films and hosts live shows to this very day. A survivor of sorts, the moviehouse located at 2343 California Avenue (between West College and Admiral Way) originally opened in 1919 as the Portola. 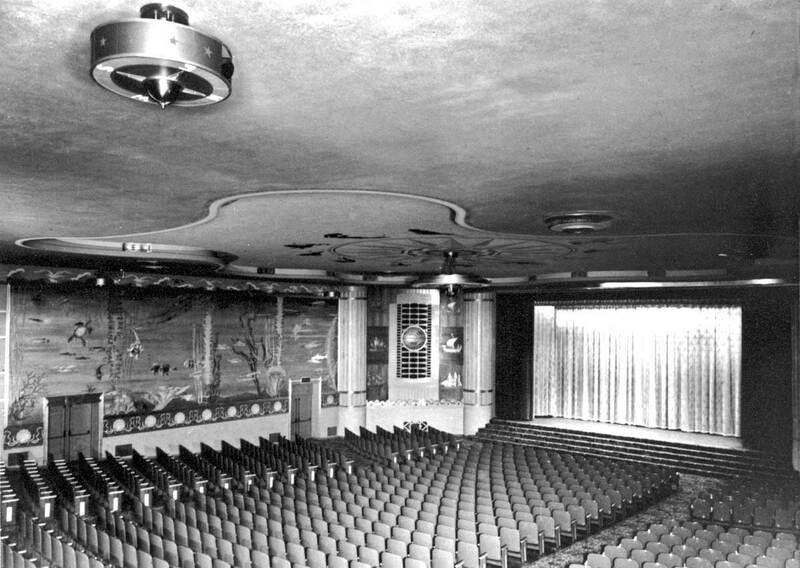 Seattle theater magnate John Danz undertook an extensive expansion and remodel of the building and reopened as the Admiral in January 1942. The theater was “twinned” in 1973. What remains today of the old Portola is the shell which became the entrance and lobby of the Admiral. West Seattle’s only surviving fulltime movie theater (there were half a dozen) has faired better than its neighbor to the south, The Granada (5011 California), which opened in 1926 and fell to the wrecking ball in 1977. 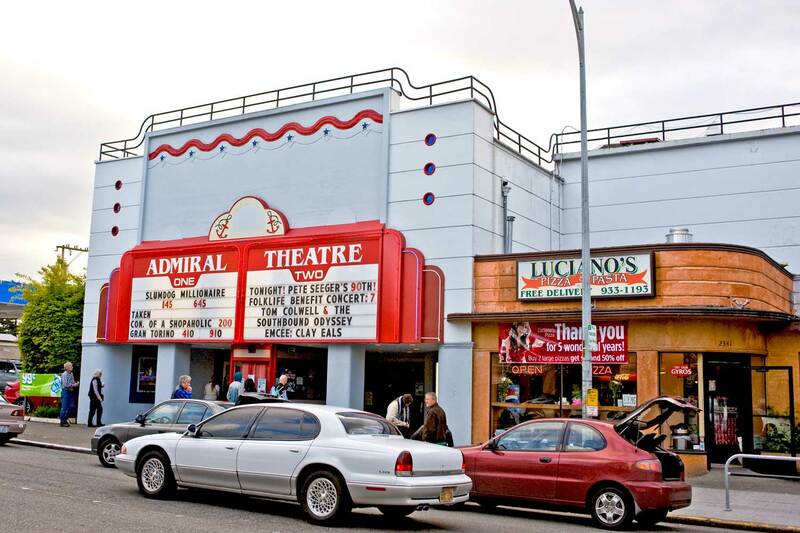 The 2009 Seattle International Film Festival will include a full week of screenings at the Admiral, June 5-11. Here are a host of related links, including one from (bless his soul) Emmett Watson.